Social Thinking is Michelle Garcia Winner's outstanding program that teaches the "why" behind social skills. We are huge fans of hers, and I was very fortunate to see her speak at the Autism Society of North Carolina's annual conference two years ago (click here to learn about the 2014 ASNC Annual Conference, featuring keynote speaker Dr. Jed Baker). There are two great opportunities coming up soon to learn more about Social Thinking, a class for parents in February and a conference for parents and professionals in March. 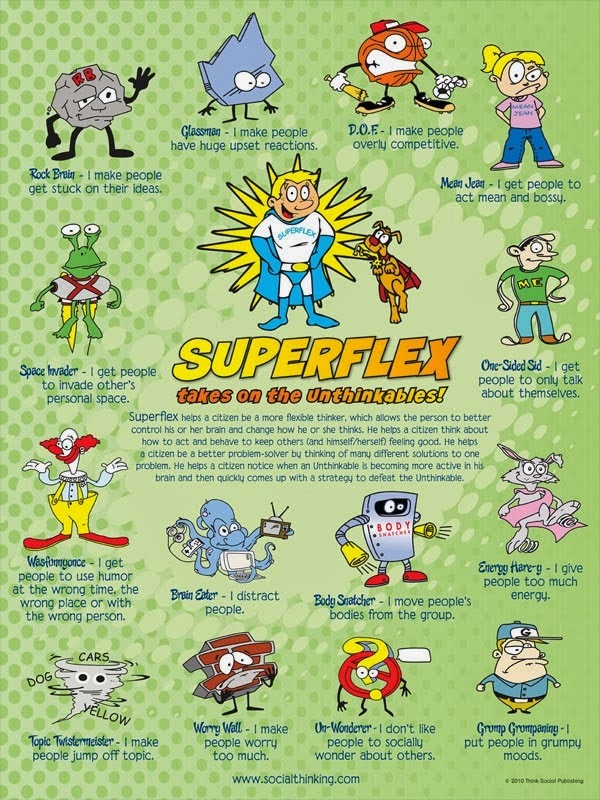 My son loves Superflex and the "Unthinkables"! This class will empower you to help your child learn to navigate the social world by working on & understanding the thinking behind social skills at home, at school & in the community. Based on Michelle Garcia Winner’s Social Thinking® framework, you’ll be given tools to assist your child in understanding unwritten social rules, taking perspective of others & becoming more flexible in social situations. "Disclaimer: while this program incorporates the Social Thinking concepts and strategies originally created by Michelle Garcia Winner, it is not affiliated with, endorsed or approved by her or Think Social Publishing, Inc."
I took this class last year, and found it to be very helpful. The instructor provided very clear lessons about Social Thinking with practical ideas on how to apply the strategies at home. She also included time for parent discussion during each class, so participants could gain insight into their individual children. Highly recommend! Michelle Garcia Winner is coming to the Triangle in March! She is from California, so this is a rare opportunity to see her speak in North Carolina. Event Description: Recharge, refresh, and re-energize your teaching curriculum! If you’ve been hearing a lot about Social Thinking, but aren’t quite sure what it’s all about, or how to teach it, join us!. You’ll hear Michelle present two days of core material about Social Thinking, infused with new thought and updated information! Even if you’ve heard her speak before, you’ll find new strategies to take back to your clinic or classroom to improve how you teach your students. Join us and better understand the inner mind of persons with social learning challenges, whether or not they have a formal diagnosis. Take home practical tools that can be immediately used by parents and professionals to better define treatment needs and create tailored treatment plans. Cost: Early Bird Registration (by March 13th): $295 for parent, family member, student / $340 for professionals, paraprofessionals. More details are available on the Social Thinking website. Group discounts are also available. Interested in learning more about Social Thinking? Visit the CHART Lending Library to borrow the book Thinking About You, Thinking About Me: Teaching perspective taking and social thinking to persons with Social Cognitive Learning Challenges by Michelle Garcia Winner. Come back soon to learn about more autism related events coming up in the Triangle!